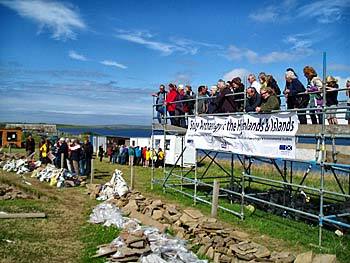 Today was open day on the Ness, and people came from far and wide to see the amazing structures and artefacts from 5,000 years ago. Truly, the folk from the Neolithic would be astonished to see the enthusiastic reaction to their considerable building and manufacturing skills. 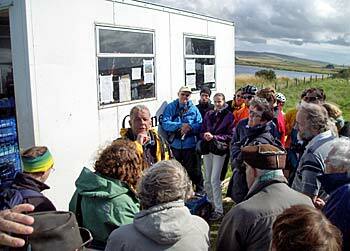 The car park was full to bursting with 100 plus cars at one point, and people and accents from every corner of the globe could be found thronging the tours conducted by the dig staff and students and the Rangers from Historic Scotland. (Note to potential visitors, tours continue until Tuesday, inclusive). Final numbers are still being counted but we seem to have been visited by around 700 people today – 200 in the first hour! Added to the constant stream of visitors over the past five weeks, we have easily surpassed the head count from last year of just over 5,000 visitors. This is such an added to bonus to the excavation to see such a wide range of people taking such a great interest in our work – thank you one and all! Work continued in the trenches, however, for with just five days left on site, there is still a good deal of tying up loose threads to be done. In Structure Ten, Adam finished odds and ends of planning and Scott carried out the last of his XRF work. The results of his analyses will be of tremendous importance to understanding the structures on the Ness and the manner in which they were used in the later Neolithic. The loneliness of the sole XRF operative – Scott finishes taking his last samples from Structure Ten. The final spit of midden was removed from Structure Twelve, although there is plenty left for next year, and the years after. Excavation continued in the annex to the structure and section drawing was carried out in the central midden area. Dave has finished the Herculean task of planning Structure Eight alone. Nobody is quite sure how he managed it, but on Thursday, which was the last working day, he was glimpsed planning-on through the driving rain. Ingrid continued to excavate a small area of the bone spread in the passageway surrounding Structure Ten. As usual, a large number of cattle tibia emerged, perhaps indicating the remains of some 15-20 animals, out of the many hundreds to be found in the passageway as a whole. Tomorrow there will be more planning, a little digging, and the beginning of the effort to close down the site safely for the winter. There will still be plenty to tell those who visit us in the next couple of days. We will also be visited, for the last time, by the BBC crew, accompanied by their presenter, Neil Oliver – so busy times ahead! My name is Jayne and I am one of the MA students based at Orkney College. 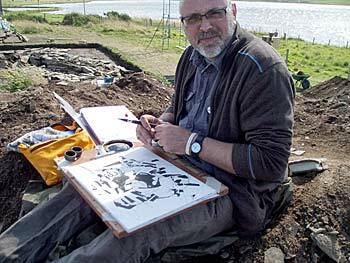 Digging at the Ness of Brodgar has been a great experience; the richness of the archaeology here is just amazing. For the first two weeks of the dig, I was based in the north-east corner, in what is now called Structure Fourteen. This structure has developed so much in the last few weeks, for when I was digging in there, it was not defined and so did not have a number. Along with starting to define what was in this corner, one of the amazing finds which I have seen uncovered on this dig was a complete pot, only small in size, but it was recovered whole, and also had incised decoration around it. It is just amazing to think that I was in the first five people to see that particular pot for 5,000 years; it is just so mind blowing. After a week of doing other survey, during the third week, I have been based in Structure Eleven for the rest of the dig. It is another really interesting structure, as all the structures are on the site. What I have found interesting about this structure especially is the notched slab within it, which forms part of the one of the walls of this building. Although we don’t know what this slab is exactly, I’m sure the function of this stone will be made clearer in later years of the dig. The overall size of the excavation makes you realise how big the entire site actually is. Only a small percentage has been excavated so far, as shown through geophysics. It makes you wonder what other wonderful and amazing structures and artefacts are still hidden in the soil. If what has been found so far is anything to go by, that is a lot! In the past six weeks, over 3,000 finds have been recorded on the site. Although a lot of this has been pot, of which has been great in itself, other finds, such as maceheads, axes, other stone tools, as well as finds such as a clay tool which was used for mixing paints was found. These finds, along with the structures on the site, helps us to discover and also to think about what life was like 5,000 years ago in Neolithic Orkney. Hello my name is Kim and I am also studying MA Archaeological Practice at Orkney College UHI. 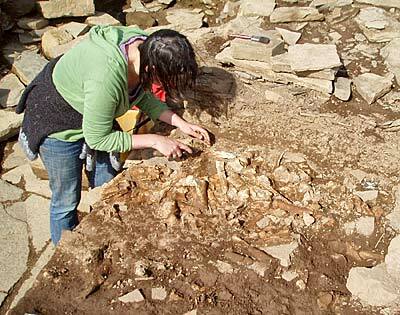 I chose this course as a career move and because I was “bitten by the archaeology bug” after living here for three years – frequently encountering the unique archaeological sites that make Orkney so special. Digging at the Ness of Brodgar has been an exciting and worthwhile experience, not only because of the incredible archaeology, but also due to the wonderful variety of people that have come from all over the world to give their time to be part of this excavation. As the weeks went by, it was quite sad to see the familiar faces disappear. I too have been excavating Structure Eleven and the highlight for me was discovering a stone ball in the alcove of the wall. It appeared to have been deliberately placed there, under a layer of midden. The purpose of the ball is not known, but I wonder if artefacts such as these were a craft in themselves, and that someone, 5,000 years ago, may have been proud of their creative achievement. The stone ball may be connected with the large notched slab located to the south of where it was found. Apart from this, I have found some flint and some broken pottery. 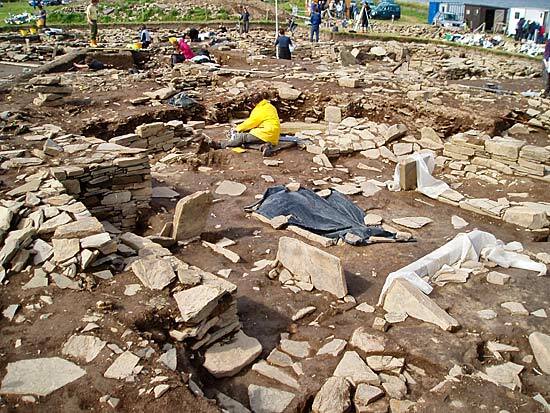 On the “no find” days, it is important for us to keep in perspective that the uncovering of walls, orthostats, rubble and midden are all significant in piecing together the story of the Ness of Brodgar. However, it is not just digging we do. There have been a variety of tasks given to us, such as recording finds with the Total Station or GPS equipment, photographing our progress and drawing the scale plans of structures. 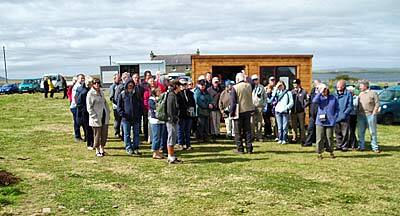 Today, the MA students also gave a site tour to the visitors – so there is never a dull moment.